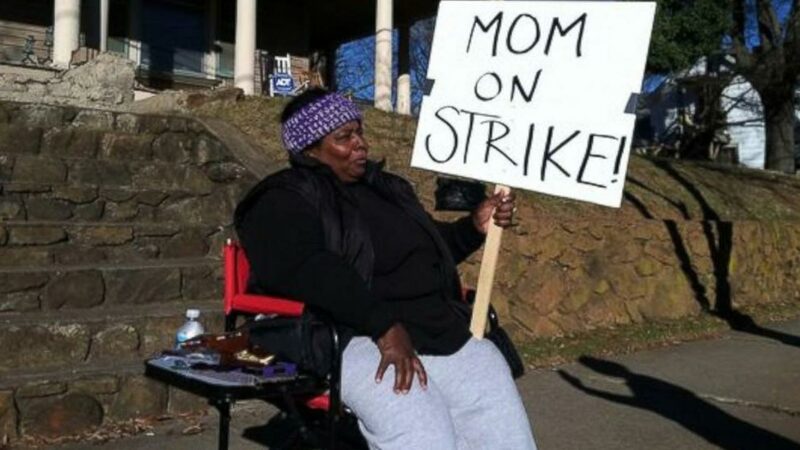 WINSTON-SALEM, N.C. (WLS) -- A North Carolina mother is walking a one-woman picket line to protest her daughters' insolence. Naasira Muhammad says she's protesting her teens' "out of control behavior" after one of the girls keyed her brand new minivan, according to ABC News. "I'm to the point where I'm just so frustrated, so to keep my hands off my kids or to keep me from doing something crazy, I just decided to go on strike," Muhammad told WFMY. "I walk up and down the sidewalk until my knees hurt, and then I sit down." Muhammad says she tried to call the police about her minivan, but was told that they couldn't do anything without eyewitnesses. "My children have everything that they could possibly want and need, but yet still, they are disrespectful," Muhammad told WFMY. "They are rude. They think that I'm the meanest mom in the world. They think they can survive without me, so I said, you know what? That's fine. This mom is going on strike." Muhammad has reportedly been picketing since last Friday, though it's unclear if the family has patched things up. Some people on social media have criticized her decisions, but Muhammad stands by the choice to strike. Going on strike "is the only solution that I could think of other than get rid of my children," Muhammad told WFMY. "But I would not go to that extreme."